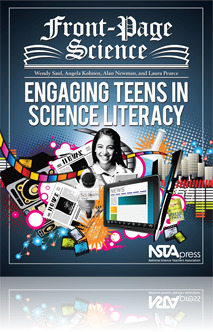 Like citizen journalists, your students can get to the heart of science literacy—and challenging questions like these—with the “learn by doing” methodology in this innovative book. Front-Page Science uses science journalism techniques to help students become better consumers of, and contributors to, a scientifically literate community. A free website provides downloadable lesson plans, teacher suggestions, and a forum for exchanging ideas with others. Like Front-Page Science, the website is part of the National Science Foundation–funded Science Literacy Through Science Journalism project. By making full use of these rich resources, you’ll teach your students skills that will help them make sense of their world not just now, but also after graduation and for years to come. As I read this book, the greatest benefit of the science literacy through journalism approach is to encourage youth to appreciate science and technology for its contributions to the economy and its role in public policy. …I think any school that wants to improve its students’ interest in science would benefit from adapting some of or the entire program described in this book.